The Cosmos Group is a great band-- if your objective is to become completely and utterly deaf. The first of three bands, the Cosmos Group greeted the assembled mass of about 25 with an earful of deafening feedback. Creaking and squealing their way through the first few songs, the guitar and drums duo gradually made a slow transition to something a bit milder. After nearly 15 minutes of squalling over barely audible drumbeats, the guitar started to sound a bit more like a guitar and less like an injured animal screaming in pain. While I found the latter half of their set nearly ear-shattering, the music slowly eased into something more pleasant. By the last song of their set, in which the guitar was emitting sounds reminiscent of R2D2, the music became an agreeable mixture of rhythmic guitar beats and steady, ominous drums. Almost hypnotic, the music made a welcome transition just before the set's end. Hardly a complete jazz connoisseur, I'm not the one to consult when it comes to bands in this crazy mix of genres. Perhaps this music appeals to someone, but certainly wasn't me. Just on the heels of their latest CD release, The Story of My Heroics (Jealous Butcher Records), Made for TV Movie, took the second position on the bill. Hailing from Portland, this combo plays a passionate mix of guitar, bass, and guitar. Slightly mild at times, while bouncily passionate at others, the affect was always heartfelt. Lead by a sometimes distorted guitar, the music had a spasmic feel to it. Singer Dan Devriend dominated his side of the stage while shrouded in the mysterious hanging blue light. The convulsions in his near breakable-looking build only emphasized the level of frantic emotions physically conveyed on stage. In the course of seconds, Devriend would switch from frenzied vocals, to intense guitar, to a floor-level collapse while screeching into his guitar. Bouncing steadily, bassist Tanya Smith kept a beat of her own off to the green-lighted side of the stage. Hidden in darkness, drummer PJ Aylward focused on accompanying rhythmic beats. Playing a key role, Aylward's drum beats existed as a well-timed, powerful addition to their sound, rather than a starting point. All things considered, the group played a searing set of music that seemed to satisfy the small crowd. Crosstide, in only their second show after returning from a year-long hiatus, topped the night off with an hour-long set of mellow, blissful emo-style music. 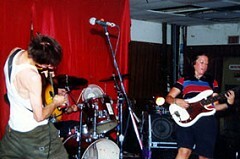 Having just released their second CD, Crosstide has survived a near complete re-tooling of their band. With only one original member in the new incarnation in bassist/guitarist/vocalist Bret Vogel, the band carries every bit of its former essence. With the driving power of two guitarists, the music jumped from peaceful melancholy, to driving frustration, to passionate outpour in mere minutes. During the course of an hour, the band managed to draw in the rapt attention of the crowd. 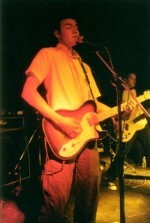 Fronted with a quiet urgency by Vogel, the band formed a cohesive group. As a vocalist, Vogel's tones range from the silky stylings of 'Backwards,' to the whining choruses of the driving 'Washout' -- all while maintaining a constant emotional potency. Affecting the mood of the songs tremendously, Vogel's singing added a touch of raw and humble honesty to each. Varying in mood, the double guitars were used to create both single notes and fully distorted choruses. The bass provided a nice backbone while the drums alternated between providing steady outlying structure and serving as a tool of emphasis with additional beats and pauses. With the variety of tactics, Crosstide utilized its instruments to full potential, making them an integral, key part of the music. Each song's immediate simplicity gave way to a complex weave of sounds just beneath the surface. With a humble, soft-spoken, and somewhat awkward stage presence between songs, the group quietly encouraged their small crowd throughout the night. Ending with the forlornly touching song 'Tried,' Crosstide finished off the night having gathered the crowd's calm, attentive interest.